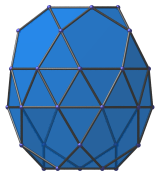 The gyroelongated pentagonal birotunda is the 48th Johnson solid (J48). 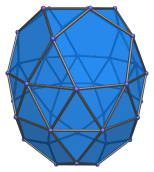 It has 40 vertices, 90 edges, and 52 faces (40 equilateral triangles and 12 pentagons). 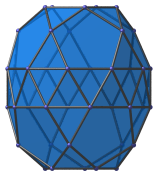 The gyroelongated pentagonal birotunda can be constructed by attaching two pentagonal rotundae to a decagonal antiprism, or equivalently, adding a pentagonal rotunda to a gyroelongated pentagonal rotunda (J25). 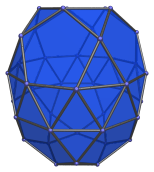 where H = √(√(11φ+7)−2φ−1), approximately 0.862397, is half the height of a decagonal antiprism of edge length 2, and φ = (1+√5)/2 is the Golden Ratio. 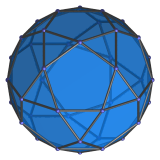 Last updated 19 Jun 2018.